(CNN) -- German automakers Volkswagen and Porsche have reached an agreement to merge operations -- the latest move in an industry that has seen whiplash changes in recent weeks. Porsche, which recently launched its luxury sedan Panamera, will merge with Volkswagen. The two companies have been in talks in recent weeks about merging manufacturing operations. A statement on the Porsche Web site said the management boards of Porsche and Volkswagen had agreed in principle for the creation of an integrated car manufacturing group. "In the final structure 10 brands shall stand below an integrative leading company alongside each other, whereby the independence of all brands and explicitly also of Porsche shall be ensured," the statement said. Porsche had been aggressively trying to take over Volkswagen, building a 51 percent stake in the company with ambitions to raise the stake to 75 percent. But Porsche also built a debt of nearly $12 billion as the world automotive market began to shrink during the financial crisis. 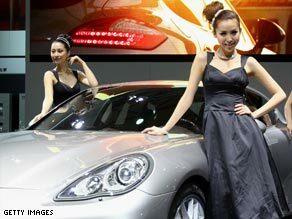 The agreement includes undisclosed "capital measures," the Porsche statement said. The move comes as Chrysler filed for bankruptcy protection and Italian carmaker Fiat has announced ambitions to combine with Chrysler and GM Europe operations to form one of the world's largest car companies.